The World No. 34 from Georgia celebrates his second title of the season. 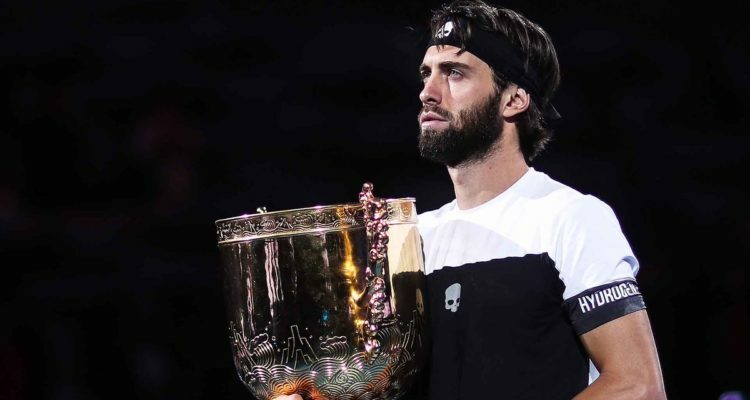 Nikoloz Basilashvili is the champion of the China Open. The 26-year-old from Georgia upset top seeded Argentine Juan Martin Del Potro 6-4, 6-4 in Sunday’s final of the ATP-500-event. Basilashvili withstood 11 aces, breaking his opponent’s serve two times to prevail after one hour and 39 minutes. The World No. 34 collects $733,320 in prize money as well as 500 ATP-Ranking points. Earlier in the day, Lukasz Kubot of Poland and Marcelo Melo from Brazil clinched the doubles title. The No. 2 seeds beat the tournament’s top seeded tandem of Oliver Marach from Austria and Mate Pavic of Croatia 6-1, 6-4. The final lasted 65 minutes. “It means a lot for us. I think it was a great week… we finished with the title. [There were] some ups and downs, but we are very happy. I love to play in China, I always feel good,” said Melo. “It was a very important tournament for us, especially right now with the ATP Doubles Race To London. It gives us a lot of confidence. We had four great matches here in Beijing,” Kubot added. This entry was posted in ATP Tour, ATP Tour News and tagged ATP World Tour, Beijing, China Open, Nikoloz Basilashvili.